The financial results of Indian retail companies were a mixed bag for the March quarter as well as for fiscal year 2018. Some retailers delivered muted like-to-like performances, while others such as Titan Co. Ltd impressed with better profit margins. Same-store-sales growth at Future Retail in the March quarter was disappointing. The firm has consistently delivered 10%-plus same-store sales growth for many quarters in a row. That trend broke in the March quarter with same-store growth coming in at 6%, the slowest in the past eight quarters. Shoppers Stop Ltd’s same-store sales growth at its department stores fell 4% year-on-year (y-o-y) last quarter. This comes after a lacklustre 1.4% same-store growth in the yardstick in the December quarter. D-Mart doesn’t declare quarterly same-store or like-for-like (LFL) numbers, but the measure for fiscal 2018 dropped to 14.2%, the slowest in five years. 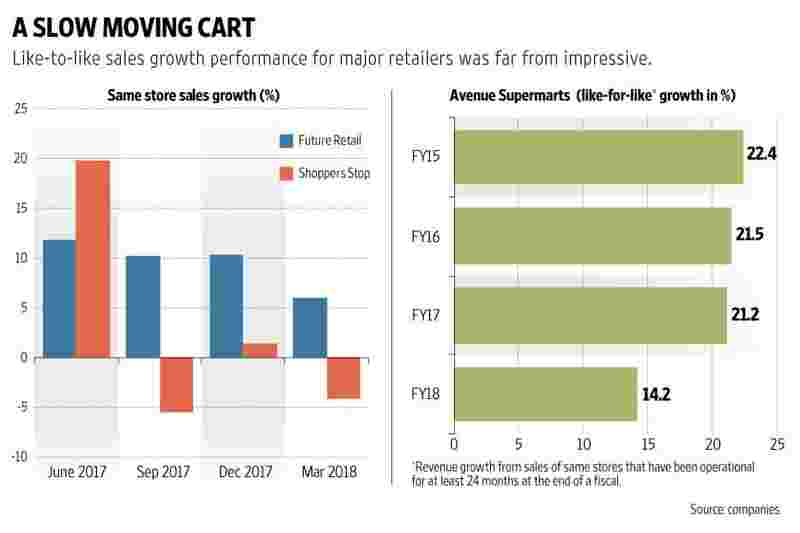 D-Mart is run by Avenue Supermarts Ltd. LFL growth in case of D-Mart means revenue growth from sales of same stores which have been operational for at least 24 months at the end of a fiscal. The company says adjusting for the taxation impact (introduction of the goods and services tax), there is an adverse impact of 2.2% on LFL growth. Even so, FY18 LFL growth isn’t encouraging. Titan’s jewellery business revenues, which accounted for about 80% of overall revenues, saw a 13% y-o-y increase on the strong base of the March 2017 quarter. Jewellery earnings before interest and tax (Ebit) margins improved to 13.7% from 9.7% in last year’s March quarter. However, the performance of the watch business, the second main revenue contributor for Titan, was nothing to write home about. Shoe maker Bata India Ltd’s March quarter performance was in line with estimates. Focus on fashion and casual collections helped the firm report 7% y-o-y growth in net sales. But the outlook is expected to be rough for Bata on account of higher competition and improved and economical offerings by peers. Titan, on the other hand, is expected to benefit from the shift to the formal sector. The Nirav Modi-Gitanjali Gems scandal will also help as consumers would seek brands they think are reliable, and Titan offers comfort here. However, Titan’s pricey stock valuations suggest investors are pricing in most of the optimism. D-Mart shares are expensive, too. Its improving product mix should support revenues, and investors should watch how that shapes up. In general, an improvement in same-store sales will augur well for all these firms. For the Future Retail stock particularly, turnaround in Hypercity (bought last year) profitability will be a key parameter to follow.